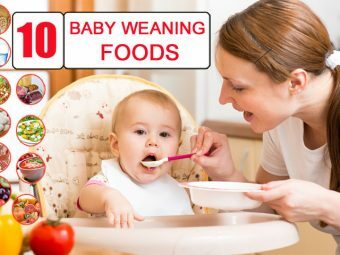 Has your baby started weaning? Are you looking for some wholesome and nutritious recipes to include in your baby’s diet? If you nodded along in acceptance, you might want to read this post! Here we list some wonderful recipes that you can whip up in less than an hour. Making baby food at home is one of the easiest ways to ensure that your baby gets all the nutrients required for a healthy development. It may seem easier to buy jars of ready-made baby food, but nothing beats the goodness of wholesome homemade baby food. Here are 15 of the best wholesome baby food recipes that add the necessary nutrients to your baby’s diet. Sprinkle cinnamon into the cooking water. Place the halved pumpkin in a baking pan with 2 inches of water. Bake for 40 minutes to an hour at 375 degrees Fahrenheit. Scoop out the meat and mash or puree it, as per your baby need. Add nutmeg powder to water. Add 2 cups of water in a saucepan and insert a steamer basket. Add the pumpkin cubes and apple slices to the steamer basket. Bring the water to boil and then steam until the pumpkin and apples are soft. Puree and mash the fruits and serve. Cook the quinoa according to the package instruction. Add the grated cheese and season with salt. Let it cool for a few minutes before forming into bite sized balls. Cut the eggplant in half and scoop out the flesh, leaving a thick shell. Blanch the eggplant halves in boiling water for 1 minute. Place the eggplant halves in an ovenproof dish. Meanwhile, dice the eggplant flesh. Heat some oil is a frying pan and sauté the minced lamb over medium heat. Then add the onion, minced garlic, eggplant and reduce the heat. Cook until the onion is tender. Season with salt and pepper and reduce the heat. Fill the eggplant halves with the meat mixture. Add the tomatoes over the eggplant and bake for 45 minutes. Let it cool for some time before serving. Heat oil in a frying pan and cook the chicken until it changes the color. Place the chicken in a baking dish. In a saucepan, sauté the onions in butter until soft. Then stir in the flour and cook for 1 minute. Slowly add the stock and bring it to a boil. Add the beans, tomatoes, and black pepper and bring it to a boil. Pour it over the chicken and bake for 45 minutes. Peel and core the apple and cut it into small pieces. Boil 2 cups of water in a saucepan and add the lentils. Bring the lentils to boil and reduce the heat. Simmer the lentils on low heat for 20 to 30 minutes, until the lentils are soft. In another saucepan, insert a steaming basket and add 1 cup of water. Place the sweet potato and apples in the steamer basket and steam for 20 minutes or until the sweet potatoes are tender. Remove the foods from steam and drain the excess liquid. Combine them in a large bowl with olive oil. Season with spices and toss well. 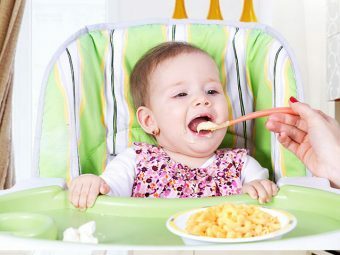 You can also mash or puree the food together if your baby does not enjoy the lumps. In a food processor, place chicken with cooked apples and carrots and process on high. Add cinnamon and process for another minute. In a shallow baking dish, combine sweet potato and peaches. Add water to cover the food. Sprinkle cinnamon over the baking dish and cover with a foil. Bake for 20 minutes or until the peaches and sweet potatoes are tender. Make sure you keep checking the water level. When done, transfer the sweet potatoes and peaches to cool. Puree or mash as per your baby’s need. Cut the butternut squash in half and scoop out the seeds. Add a cup of water in the baking pan and place the squash halves face down in the pan. Bake at 400 degrees for 40 minutes or until the flesh softens. Scoop out the flesh and puree until smooth. You can add breast milk or water to achieve a smooth and thin consistency. Peel and core the apples and cut them into chunks. Place in a saucepan filled with water. Steam or boil the apples until tender. Transfer the apples to a bowl, and mash using a masher to achieve a smooth consistency. Or, puree the apple in a food processor. Serve the applesauce with baby cereals. Peel the sweet potatoes and cut them into strips. In a mixing bowl, add olive oil and spices. Transfer the sweet potato strips to the bowl and toss to coat well. Then move the sweet potato pieces on the baking sheet and drizzle the remaining olive oil. Bake for 30 to 45 minutes until tender. Peel the sweet potato and cut into half. Cut half the sweet potato and cut into ¼ inch cubes. Cut the remaining sweet potatoes into 1-inch cubes. Toss the sweet potato cubes in 1 tablespoon olive oil and roast for 30 minutes. Puree in the food processor with 1/4 cup of chicken stock. In a saucepan, heat three tablespoon of oil and sauté the onions and small diced sweet potatoes over high heat. Cook for 3 minutes, until it is soft. Add the rice and garlic and cook for 3 minutes, frequently stirring. Stir in the white grape juice and cook until completely absorbed. Then add the stock, ½ cup at a time. Keep doing the same until the stock is used up. Add sweet potato, thyme, rosemary, thyme, butter, Parmesan cheese and simmer on low heat for 10 minutes or until the risotto is soft. In a large saucepan, mix flour and butter to make a roux. Cook for 2 minutes or until it is of caramel color. Add broth and brown sugar and bring to boil. Then stir in the sweet potato and spices and cook for 5 minutes. In a food processor, puree the soup and return to the saucepan. Add the milk and reheat the soup. Season with salt and pepper and serve. Preheat the oven to 375 degrees Fahrenheit. Coat a baking sheet with olive oil and leave it aside. In a mixing bowl, mix all the ingredients. You can season with garlic powder, oregano, and basil if you are serving to a toddler. If your baby is allergic to eggs, then substitute it with a vegetable puree. Shape the mixture into nuggets or square and place on a baking tray. Bake for 25 minutes, turning the nuggets over after 15 minutes. Crumble the nuggets before serving to your baby. Place the acorn squash half up in a shallow baking tin. Add enough water to cover the squash. Then place the diced apples in the squash holes. You can sprinkle cinnamon if you want. Cover with aluminum foil and bake for 400 degrees Fahrenheit for 40 minutes or until the skin puckers. Puree the baked apples and butternut squash, adding water to thin. 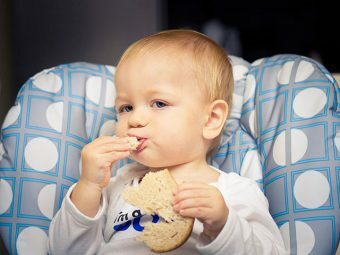 Consult your pediatrician before introducing any new food into your infant’s diet. Follow the 4-day wait rule when introducing new food to baby. It means that offer your child the same food for four days to check for allergies. 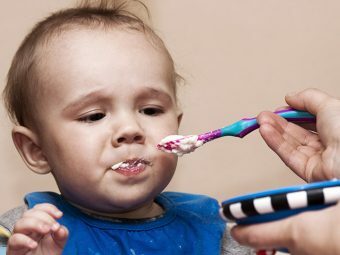 Do not introduce more than one food at a time when beginning with solid foods. Cleanliness should be your top priority. Use clean hands and clean utensils for preparing food for your baby. Each baby is different and will not like the same food or textures. So try to experiment with these wholesome baby foods. 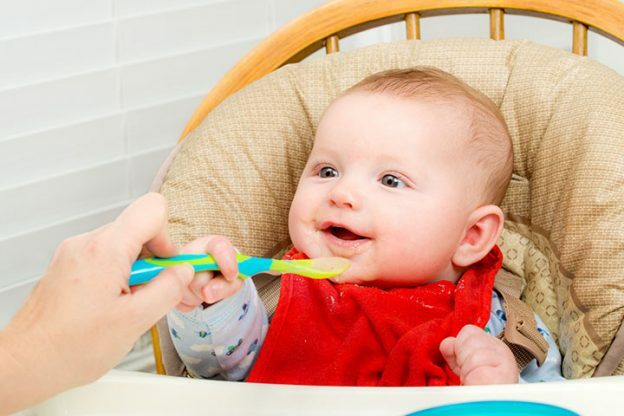 Use different ways for preparing the wholesome baby food guide for your baby. These sumptuous wholesome baby food recipes will surely appeal to your little one. You can even store some of these meals for later use. Introduce each recipe to your baby once a week and tell us which ones they liked the most. Leave a comment below.